C Costa-Sánchez, AI Rodríguez-Vázquez, S Direito-Rebollal (2017): “Web 2.0 on university teaching. Web 2.0 effects as subject of study in Spanish communication journals”. Revista Latina de Comunicación Social, 72, pp. 1.300 to 1.316. Introduction. The emergence of the so-called Web 2.0 has substantially modified the forms of communication and teaching in said sector must also keep the new context in mind. The present paper performs an analysis of research about university teaching and social media in the 2010-2015 period. Methodology. We have collected all articles published in the Spanish communications journals indexed in Scopus that talked about the phenomenon. We intended to investigate the relevance of the theme in the research agenda of the last years, as well as to synthetize the areas of knowledge, the field of application, the time evolution, methodologies, tools and the main results and conclusions of said studies. At methodological level, contents analysis has been used to delve deeper into what has been theorized and analyzed empirically. A total of 2344 articles have been reviewed, whereas 103 configured as study sample. Results and conclusions. The research concludes that it is a theme of increasing interest for teachers of different fields of knowledge, that initiatives of Teaching 2.0 are being developed specially in graduate studies of Journalism and that the technological potentialities of the so-called participative Web are embraced with more optimism than critical perspective. 1. Introduction. University teaching in change. 2. Material and methods. 3. Results. 3.1. Relevance and relative importance. 3.2. Time evolution. 3.3. Area of knowledge. 3.4. Methodology. 3.5. Teaching area of studies. 3.6. Analyzed 2.0 platforms or applications. 3.7. Research techniques. 3.8. Themes. 3.9. Main conclusions of analyzed articles. 3.10. The communication classroom 2.0. 4. Discussion and conclusions. 5. List of references. 1) The students today are not the same as the students of 10 years ago. They have been baptized as «digital natives», «digital generation» or «generation Z», they are surrounded by screens, are multitasking, prosumers, multimedia, prefer video to text and in general, have integrated ICTs in their daily lives naturally (Prensky, 2001; Tapscott, 2008; Toffler, 1981; Piscitelli, 2006). 2) If the recipient has changed, the learning dynamics and methodologies must adapt, because it is important not to contemplate ICTs from an instrumental and technologistic perspective (Gutiérrez and Tyner, 2012), but instead as part of the teaching-learning process and from the possibilities and benefits they can contribute with for a collaborative, creative, critical and autonomous learning (Salinas and Viticcioli, 2008; García Sans, 2009; Aguaded and López, 2009; Vaquerizo, Renedo and Valero, 2009; Trujillo, Raso and Hinojo, 2009; Churchill, 2009; Area, 2010; Martínez and Hermosilla, 2011; Gikas and Grant, 2013; Buitrago, Canga and García, 2015; Martínez Clares, Pérez Cusó and Martínez Juárez, 2016). Besides, the digital alphabetization itself, which is also necessary (Area, 2010; Gutiérrez and Tymer, 2012), it is about a new means for the improvement of the teaching quality and its results (Barnes and Tynan, 2007). 3) The role of teachers is modified because they stop being keeper of knowledge to become not only a facilitator, mediator and guide (Salinas, 1998; Buckingham, 2005), but also a manager and coach of a virtual community, selector and prescriber of resources and information or conversationalist 2.0 (Cabero, López and Ballesteros, 2009), which entails new competences (Del Moral and Villalustre, 2012; Cabero, 2014). The professor 2.0 must perform new tasks and perform different competences to comply with the teaching needs of students in the current technological context, selecting and adapting every application and Web 2.0 tool to the students’ characteristics (Del Moral and Villalustre, 2012, p. 65). 4) Contexts of access to university teaching are and must be multiple and flexible to favor teaching and education in different situations and throughout life (Darós, Darós and Liern, 2011). 5) Specially, regarding communication studies, these must adapt to the new communicative uses the society and organizations experience, in order to prepare professionals of tomorrow for the new platforms, publics and forms of interaction (Vadillo, Marta and Cabrera, 2010). Therefore, teachers around the world are thinking whether educational institutions are ready to meet the new needs of XXI century students, who bring along with them different approaches on education, leisure and life in general (Burkle, 2009). The gap existing between the potentiality of ICT incorporated in classrooms and the scarce renewal of pedagogic process is added thereto (Esteve, 2009; Duart, 2011). According to Area and Pessoa (2010), alphabetization in the Web 2.0, must represent a process of development of an identity as subject in the digital territory, which is characterized by the significative appropriation of intellectual, social and ethical competences needed to interact with information and to reproduce it in a critical and emancipating manner. Like Ferrés and Masanet (2015) synthetize, today the mediatic experience includes both mass media as well as social media, which creates a new environment leading unavoidably to the university field. Custodio (2008) indicates some of the 2.0 tools teachers should know in order to improve research processes, creation of knowledge and diffusion: blogs and wikis, social markers, aggregators and RSS, podcast and videocast or sharing multimedia services. Guerra, González and García (2010) suggest proposals of training and implementation in the use of ICT that consider allow working in a collaborative manner among the university community, at the same time as they offer opportunities to acquire digital competences, such as: wikis, on-line collaborative tools, blogs, forums, networks and social markers. More than five years ago the communication studies program in Spain formally adapted to the European Higher Education Area (EEES in Spanish - EHEA). Since then and up until now changes in the sector of communication haven’t stopped. A first balance is required about the knowledge related to the university teaching and the changes Web 2.0 entails. This research intends to know what has been investigated about it to approach, subsequently, to the new dynamics, methodologies and tools that are being used in the post-Bologna university teaching. The objective of this research is to offer a review of academic articles published in the last lustrum (2010-2015), in Spanish scientific journals of the Communication area indexed in Scopus and that talk about some of the aspects of the Web 2.0 use in university teaching. The initial hypothesis is that the academic knowledge about this theme is in a moment of analysis and reflection more theoretical than practical (h1), that it shows an increasing interest as the analysis period progresses (h2), that from education sciences more than communication is where this subject of study has been treated the most (h3) and inside the communication area is mainly the Journalism the one predominantly framing the approach towards this issue (h4). Beyond that, this paper also intends to systematize in a general manner the main conclusions about university teaching 2.0 to determine which are the research lines suggested for the progress of the teaching practice and knowledge, because it is about a core and transversal theme to the different disciplines and of common interest for all teachers. We chose last five years (2010-2015) as analysis period due to several reasons. Firstly, because five years is the suitable period to perform an adequate theoretical review (De la Torre, 2010). Secondly, because the course 2009/2010 entails the practical onset of EHEA in Spain and in the different university degrees, therefore it is the date when a new phase starts in the Spanish university educative context, quite determined by a more straightforward, flexible and horizontal teaching methodology. Thirdly, because 2010 is the year the social network Instagram was launched, based on the use of image, and which can be considered as exponent of the so-called second generation of social networks (González Macías, 2014). We decided to analyze Spanish journals indexed in Scopus because, together with Web Of Knowledge, is one of the databases of international reference and the one indexing more Spanish communication journals. We have registered all articles talking directly or indirectly, about the use of social media and 2.0 applications both in face-to-face teaching as well as distance teaching, in any kind of university studies and we applied a contents analysis card that helped respond the initial hypothesis. The recording and analysis tool has been configured into two blocks: formal items and contents items (see Table 1). For the methodology and research techniques we used the study of Martínez and Saperas (2011). To elaborate the catalogue of 2.0 applications and tools we used Custodio (2008), Guerra et al. (2010) and Cacheiro (2011). The themes were coded after a previous exploratory analysis of 30% of the sample. Conclusions entail a freer field, without pre-stablished categories, qualitative and interpretative, just as it is justified in the corresponding section. The corpus of analysis consisted of a total of 103 articles published in the 2010-2015 period in the mentioned journals. Out of the 2344 reviewed articles, 4.4% (103 articles) talked about some aspect related to the use of the social Web in university teaching. The journals that more articles published about this theme was Historia y Comunicación Social (Universidad Complutense de Madrid), because it published several special editions (between 2013 and 2014), noticeably increasing its number of published articles and widely diversifying themes (Table 2). The greatest relative relevance, that is, number of articles in relation to the total of published studies belongs to Comunicar (Universidad de Huelva) with a 10.7% of researches published about this issue, since communication and education fields were framed in the journal’s priority editorial policies. The journal Signa (of the Spanish Association of Semiotics) eludes this theme, therefore it was excluded from the research from that moment. Less specific journals such as Revista Latina de Comunicación Social or Comunicación y Sociedad have dedicated a more reduced space to it. We located the peak of greater scientific production about the subject of study in 2013 (38 studies published), specially due to the relevance the theme reaches in the journal Historia y Comunicación Social which publishes three specials editions under the slogan ‘communication in the profession and university of today’, which seems to have encouraged the publication of these kind of papers. In the case of Estudios sobre el Mensaje periodístico its production in 2012 is outstanding, because in that year it also publishes several special editions about the theme we are managing, under the copy ‘Communication teaching in the EHEA’. In general, in the biennial (2012-2014) is when the highest attention is given to the new dynamics and its teaching application on communication journals. Previously, in 2010 and in 2011, the interest is incipient, while in 2015 it reduces up to the previous levels, which points to the need of monitoring this issue (Table 3), under the following question: Has it been a fashion coinciding with the implantation of the new graduate studies or will it continue over time and with the new changes faced by the Spanish university system? 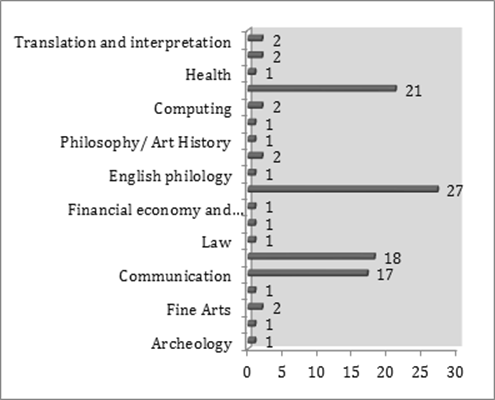 The subject of study has raised interest from multiple areas of knowledge, including from Architecture to Health, Law or Fine Arts (in Figure 1). However, quantitatively there outstand two areas of knowledge from which the theme has been approached and which are fundamentally Communication (specially Journalism) and Education. 54.4% of studies come from researches of the areas of Communication, Audiovisual Communication and Journalism, at the same time 26.2% come from teaching researches of the Education area. Most of texts observed are, either exclusively theoretical (25), or combine the use of quantitative and qualitative research techniques (27). Therefore, there is a polarization between articles of theoretical reflection and articles with fieldworks looking for methodological combination (table 4). In any case, the presence of studies of empirical profile outstand (75.6% of researches of the sample). Delving a little bit more, it is detected that articles with combined empirical methodologies (quantitative and qualitative), are mainly studies developed by researchers of the following areas of knowledge: Education (10), Communication (14), including Journalism (7), Sociology (1), Fine Arts (1) and Computing (1). Regarding the exclusively theoretical studies, there is a balance between both areas (9 articles of authors from Education Sciences and 10 of researchers in the Communication field). The rest comes from diverse areas: Philosophy (2), Architecture (1), Translation and interpretation (1), Law (1) and English philology (1). Studies carried out have been applied to the following areas of university teaching: Graduate studies of Journalism (12), Audiovisual Communication (11), Advertisement and Public Relations (8), Education (15), without specifying (35), Master’s degree, Doctorate or Post-graduate studies (6) and Others (16). Hence, the study of 2.0 Teaching in the university degrees predominates, especially in the studies of Education, Journalism and Audiovisual Communication. Its analysis in the post-graduate studies is still scarce. Said gap points to a line of research of interest for future approaches. Most of studies focus in the use of social networks (particularly Facebook and Twitter) and blogs (also in its audiovisual versions) in behalf of university teaching (Figure 2). The use of multimedia sharing tools, wikis, podcasts or videocasts is minoritarian. The category of ‘Other’ means that, either there was no reference to any specific tool but instead there was a rather general analysis, or it referred to residual non-coded categories, such as: games or videogames, MOOCs, chats, videochats, Second Life, file sharing systems or several of said tools. When a single research technique is used, studies tend to use a quantitative technique (see Table 5): either survey (19 papers), or contents analysis (7). The main technique of qualitative analysis used is observation (in 6 papers) followed by the interview (4 papers). When combined techniques are used, the usual formula is the combined use of survey and observation (11), as well as the survey and focus group (7 papers). The focus in the subject, that is, the approach of the new competences linked to ICTs and 2.0 applications both from teachers as well as university students (a total of 12 texts). The focus in the method or process, therefore the analysis of the methodology and teaching strategies as well as the proposals about the best way to use the new possibilities of the participative Web (34 texts). And specially, the focus on results, therefore, the evaluation of results teachers achieve through the application of the new platforms in their teaching activity, that is, the self-evaluation of benefits and limitations as result of its use in the classroom (49 texts). The category of Other (8 texts) comprised reviews and revisions about catalogue of tools or reflections about very specific themes. A section of a more qualitative and interpretative type has been included based on the review of conclusion sections of every article in the sample. The projects developed embrace the application of the potentialities of participative Web to the university teaching dynamics with optimism, paying attention mainly to the benefits in results. According to Padilla (2012), social networks offer potential tools to promote educative innovation and it is demonstrated that they might help in better approaching students. The benefits appear linked to the digital alphabetization, creative expansion, collaborative learning, motivation and the autonomous learning, critical development, as well as the approach to the immediate professional reality (Ruipérez and García, 2012; Bueno and Hanninen, 2012; García Manso, 2012; Iglesias and González, 2014). But this demands disposition, resources and competences both to the teachers, as well as to the teaching centers and institutions, which has turned both aspects in subject of study (Imbernón, Silva and Guzmán, 2011; Marcelo, Yot and Mayor, 2015). The critical voices have been the least, quantitatively speaking. A critical perspective has been applied when it comes to evaluate the level of digital alphabetization of students, who despite the labels of expertise in networks and Internet, show lacks in the digital competence for the educational management of Web 2.0 tools (Teruel, 2013; Cabero and Marín, 2014), and use networks with scarce critical sense (Monge and Olabarri, 2011). Besides, some studies alert about the fact that being connected or participating in social networks doesn’t mean, learning necessarily and that the most relevant issue is the acquisition of competences for the adequate use of the social network (Duart, 2011; López Navas, 2014). It is requested that the teaching policies should strengthen the competences of university teachers in the use of telematic devices, resources and tools related with the semi-presential and virtual learning (Imbernón et al., 2011). Baelo and Cantón (2010) complain about the non-existent real integration of ICTs in the university field, therefore they are not considered when it comes to stablish the program and the methodology of the subject. Duart (2011) insists: It is necessary to integrate the use of Internet in the learning planning to achieve positive results. Many of the studies specifically link the use of the new networks and applications to the new teaching space emerging from EHEA, as if both phenomena were allied (Armañanzas, 2012). In a global perspective an evolution of articles from the perspective of the professor towards the students’ can be observed. In the first moments mainly the capacities of teachers (and the universities) to apply ICTs in teaching are analyzed, but progressively the focus of attention keeps evolving towards the perspective of the student and numerous studies talk about the application of social media to improve the motivation of the students regarding the learning process and its connection with the work world through participation in real cases. In the perspective of the teachers offered in most recent articles, the point of interest it not the training of teaching anymore, but the revindication of acknowledgement for the effort and commitment new technologies demand. Likewise, a second line of evolution is detected because, while there is a start with generalized studies about the social and interactive tools as a whole in order to observe level of use in the university community (virtual campus, social networks, blogs, etc. ), there is a trend towards a greater presence of articles with a specialized focus, which focus and delve deeper in a single aspect (or networks, or videoblogs, or virtual campus...). Regarding the lines of work considered of interest about the teacher’s figure, there is the suggestion to perform more specific studies about the change processes in teachers to learn how these processes produce and to what extent they have influenced intrinsic (motivation, perception of self-efficacy) or extrinsic variables (Marcelo et al., 2015). It is recommended that they do not keep apart from social processes of change emerging with the Web 2.0 and 3.0 and to keep attention on the new communication habits developed by pupils since technology changes have been absorbed by students in first place and, afterwards, by teachers and institutions (Molina, 2013). Focusing on uses, the integration into real projects is recommended, so that students apply their knowledge and abilities to the management of situations that move them closer to the work future (Bueno and Hanninen, 2012; Castillo, Ríos, Cristofol and Carrasco, 2013). Moreover, different models of the use of social media are suggested, which can improve the teaching-learning processes (García Manso, 2012), as well as to drive the students towards a new teaching conception predisposed to the use of open virtual platforms (González Conde et al., 2012). There is the recommendation to recover the most critical and ideological approaches of media education for the development of mediatic alphabetization and the digital competence (Gutiérrez and Tyner, 2012). This section is specifically dedicated to synthetize what is happening in communication studies. Regarding time period, it is detected that in the 2013-2014 period, there is predominance of researches about social media and university teaching on communication. Said papers have been mainly published in special editions of Historia y comunicación social and Estudios sobre el Mensaje periodístico. Methodologically, two trends outstand: empirical studies without specific research techniques or empirical studies with a combination of quantitative and qualitative techniques. Hence, approaches to the phenomenon have been done, mainly, from a practical perspective, although sometimes an absence of methodology is detected, derived from the submission to a descriptive approach of teaching formulas and its results. In contrast to the global trend, researches performed are more focused in the use of blogs, audioblogs or videoblogs that in social networks (ten studies compared to seven), probably because the use of blogs allow students to put communication abilities in practice in an easy to use online platform that simulates a media. The fact it is a public platform conveys a greater level of responsibility to the student (García Montero et al., 2013). The place it occupies among social media, as reflexive tool, with a degree of control of the final user over its modalities and functions, positions it in the field of teaching exploring instead (Potter and Banaji, 2012). In this subset of researches, there also predominates the emphasis in results of application of the new 2.0 possibilities. The evaluation of different experiences and projects is carried out in a descriptive manner and from an approach based on potentialities of the new media for the face-to-face and distance teaching regarding motivation, creativity, autonomous and collaborative learning and approach to the business reality. As limitations, it has been mentioned that the use of social networks in the classroom still entail several unsolved issues regarding the involvement of the students and their belief that teaching should use traditional means. Therefore, the professor must strategically plan the objectives of this network, join them with the subjects’ objectives and motivate students (Álvarez-Flores and Núñez Gómez, 2013). As critical perspective, it has been mentioned that the university is evolving in an excessively slow manner compared to the professional practice of journalism and it was specified that technological alphabetization is not condition enough for the narrative alphabetization needed in the professional practice on media. The study performed confirms there is interest in researching the changes that the Web 2.0 is producing in Spanish university teaching, especially as reflection linked to post-Bologna teaching experiences. The specific call for papers are the ones encouraging the reflection and the scientific production about the phenomenon, therefore we would need to see whether in the future, there is an evolution towards a constant interest about the changes Web 2.0 have caused not only in communication (recurrent phenomenon in the research projects from different perspectives), but also in the teaching practice. It is confirmed that it is a transversal area for university teachers, which has promoted analysis from very different areas of knowledge. Some of the initial hypothesis are not confirmed or must be nuanced. The studies carried out are mainly practical or empirical, although there are theoretical articles and an important number that succumbs to the descriptive approach without proposing a research methodology as such (h1). The interest increases over time and reaches it maximum level in the biennium 2012-2014, but in 2015 it decreases noticeably, which leads to thinking whether it will return with the same intensity or if a dragging effect has occurred linked to the reflection about the implantation of the new graduate studies under the EHEA (h2). The education scholars have done numerous contributions, but if the studies coming from the different areas of communication are added, these are even more numerous (h3), especially highlighting those of the Journalism area (h4). The analysis detects that the research has been focused up until now in the graduate studies, leaving an important research gap regarding master, doctorate and post-graduate teaching. The studies performed have stopped specially in the use of social networks, although for researches in communication the blog has been the platform of most interest, because it is helpful to carry out a drill adaptable to different subjects linked to composition, contents and media. Probably, this issue will continue to evolve and in the next balance, the focus, which has shifted from the general to the specific, could vary the platform priority of interest again. In general, texts reveal a noticeable optimism with which the new media were welcomed from the university teaching. Studies focus their attention on results more than methodology, and in this sense, on positive results produced regarding students’ learning, professor-student relationship of teaching dynamics. The most critical and reflexive voices are a minority, but elaborate relevant observations about the need of not falling into an almighty technological faith that averts the development of critical citizen competences regarding the active Web and its possibilities. It is about preparing for a critical use of mobile devices, social networks, videogames, virtual communities, etc. There is a special emphasis in the approach between the university sphere and the practical/ work sphere. But we shouldn’t forget that the university field does not only educate professionals, but also thinkers, analysts of reality, ensuring, besides an autonomous learning, the critical and criterion autonomy that conditions learning. *Funded research. This paper is result of the project titled “Uses and informative preferences in the new media map in Spain: Models of journalism for mobile devices”, reference CSO2015-64662-C4-4-R, funded by the Ministry of Economy and Competitiveness of the Spanish Government. Area, M. y Pessoa, T. (2010). De lo sólido a lo líquido: las nuevas alfabetizaciones ante los cambios culturales de la Web 2.0 [From Solid to Liquid: New Literacies to the Cultural Changes of Web 2.0]. Comunicar. Buckingham, D. (2005). Educación en medios. Alfabetización, aprendizaje y cultura contemporánea. Barcelona: Paidós Comunicación. Buitrago, A., Canga, M. y García, A. (2015). La competencia mediática en el contexto de la educomunicación. En A. Buitrago, E. Navarro y A. García (Eds. ), La educación mediática y los profesionales de la comunicación (pp. 19-35). Barcelona: Gedisa. Burkle, M. (2009). E-learning challenges for polytechnic institutions: bringing e-mobility to hands-on learning. En M. Ebner y M. Schiefner (Eds. ), Looking Toward the Future of Technology-Enhanced Education (245-262). Hershey: IGI Global. Cabero, J. y Marín Díaz, V. (2014). Posibilidades educativas de las redes sociales y el trabajo en grupo. Percepciones de los alumnos universitarios. Comunicar. Cacheiro, M. L. (2011). Recursos educativos TIC de información, colaboración y aprendizaje. Píxel-Bit. Revista de Medios y Educación, 39, 69-81. Ferrés, J. y Masanet, M. J. (2015). A vueltas con la educación mediática. En J. Ferrés y M. J. Masanet (Eds. ), La educación mediática en la universidad española (pp. 13-29). Barcelona: Gedisa. González Macías, M. Á. (2014). Pinterest. La red social visual y creativa. Barcelona: Editorial UOC. Gutiérrez, A. y Tyner, K. (2012). Educación para los medios, alfabetización mediática y competencia digital. Comunicar. Marcelo, C., Yot, C. y Mayor, C. (2015). Enseñar con tecnologías digitales en la Universidad. Comunicar. Martínez Clares, P., Pérez Cusó, J. y Martínez Juárez, M. (2016). Las TICs y el entorno virtual para la tutoría universitaria. Educación XX1, Vol. 19 (1), 287-310. Potter, J. y Banaji, S. (2012). Medios sociales y autogestión del perfil digital: identidad y pedagogía con blogs en un máster [Social Media and Self-curatorship: Reflections on Identity and Pedagogy through Blogging on a Masters Module].Comunicar. Prensky, M. (2001). Digital natives, digital immigrants part 1. On the horizon, 9(5), 1-6. doi: 10.5209/0.1108/10748120110424816). Salinas, J. (1998). Redes y desarrollo profesional del docente: entre el dato serendipity y el foro de trabajo colaborativo. Profesorado, 2 (1), 13-24. Salinas, I. y Viticcioli (2008), S. Innovar con blogs en la enseñanza universitaria presencial. Edutec. Revista electrónica de tecnología educativa, 27, 1-22. Tapscott, D. (2008). Grown Up Digital: How the Net Generation is Changing Your World. McGraw-Hill. Teruel, L. (2013). Construcción colectiva del conocimiento a través de la web social y motivación del alumnado: Proyecto de innovación docente aplicado al Grado en Comunicación. Historia y Comunicación Social, Vol. 18. No Esp. Nov., 523-534. Toffler, A. (1981). The third wave. New York: Bantam books. Trujillo, J. M., Raso, F. y Hinojo, M. A. (2009). Competencias y nuevas estrategias metodológicas para abordar el espacio docente actual. Universitas tarraconensis: Revista de ciències de l'educació, 34, 63-90. Article received on 20 August 2017. Accepted on 7 November.